Natural bone is a complex and hierarchical structure. Bone possesses an extracellular matrix that has a precise nano-sized environment to encourage osteoblasts to lay down bone by directing them through physical and chemical cues. For bone tissue regeneration, it is crucial for the scaffolds to mimic the native bone structure. Nanomaterials, with features on the nanoscale have shown the ability to provide the appropriate matrix environment to guide cell adhesion, migration and differentiation. This review summarises the new developments in bone tissue engineering using nanobiomaterials. The design and selection of fabrication methods and biomaterial types for bone tissue engineering will be reviewed. The interactions of cells with different nanostructured scaffolds will be discussed including nanocomposites, nanofibres and nanoparticles. Several composite nanomaterials have been able to mimic the architecture of natural bone. Bioceramics biomaterials have shown to be very useful biomaterials for bone tissue engineering as they have osteoconductive and osteoinductive properties. Nanofibrous scaffolds have the ability to provide the appropriate matrix environment as they can mimic the extracellular matrix structure of bone. Nanoparticles have been used to deliver bioactive molecules and label and track stem cells. Future studies to improve the application of nanomaterials for bone tissue engineering are needed. Keywords: Bioceramics, Bone regeneration, Bone tissue engineering, Composite, Nanofibres, Nanoparticles. Bone grafts are one of the most common transplanted tissues in orthopaedic and plastic and reconstructive surgery . Bone defects occur in many different anatomical sites, with varied size and mechanical requirements. Current treatment strategies to repair bone defects involve replacing the lost bone with allogeneic or autologous bone grafts . However, autologous bone grating is limited by donor site morbidity, high failure rates and the bone harvesting procedure has a risk of surgical complications . Furthermore, the amount of free bone tissue to be harvested is often limited. To overcome these complications allogenic bone grafts have been utilised, but these are limited by risks of mediating immune responses . An alternative to these approaches is to use synthetic materials to bridge the bone defect, which either encourages new bone formation and degrade with time or provides a permanent replacement . Metal, ceramics and polymeric materials have all been investigated to restore bone defects [2-5]. The currently used biomaterials aim to match the stiffness of bone to provide adequate mechanical properties and support the induction of new bone tissue ingrowth . However, to date many of the materials used to not to integrate well with host tissue, which result in infection or extrusion and have limited bone restoration capabilities . When designing an implant for bone tissue engineering, there are multiple physical and biological requirements that the materials must provide. Recently, biomaterials are being developed which mimic the natural extracellular matrix (ECM) of the bone structure to provide cells with a similar environment that they would encounter in vivo to guide bone formation . These biomaterials have been engineered due to the emergence of a new field of biomaterial research, called nanotechnology. It is hoped that nanotechnology can provide a new generation of synthetic implants that may provide biomaterials with better biocompatibility and mechanical properties. To create a biometric scaffold, scaffolds have been manufactured from nanofibres, nanoparticles and composite of nanoparticles and other materials to form nanocomposites. The purpose of this review is to highlight current developments in bone tissue engineering with regards to nanobiotechnology. The mechanisms of the interactions with cells and nanomaterials to successfully regenerate bone will be evaluated. The applications of nanotechnology in developing biomimetic implants for bone restoration will be discussed with specific reference to nanofibres and nanocomposites. The use of nanoparticles for the delivery of growth factors and genetic DNA to support bone formation will also be discussed. To understand how to develop a successful nanomaterial for bone tissue regeneration it is important to consider the structure of native bone . Bone is a complex composite tissue with different hierarchal levels. Bone is made up of cortical bone containing a core of trabecular bone . At the nanometer scale, natural bone is considered a composite material. It consists of 30% w/v collagen fibrils and 70% inorganic calcium phosphate material . This precise composition has provided the ideal mechanical properties and architecture to support bone formation . Scaffolds are the physical constructs that carry cells and growth factors to the defect site . The ideal scaffold for bone tissue replacement would be both biocompatible and degrades at a similar rate as new bone forms [9, 10]. The scaffolds should be able to support cell adhesion, proliferation and the formation of ECM to support bone formation by providing the correct cues to the cells. The scaffolds should have the correct pore size and geometry and overall porosity to support new bone ingrowth but also provide good mechanical support [9, 10]. Nanobiomaterials are scaffolds, which possess one dimension that is less than 100 nm. In general there are three main categories of nanomaterials, which include nanoparticles (all dimensions less than 100 nm), nanofibres (two dimensions less than 100 nm) and nanocomposites (one dimension less than 100 nm). Nanomaterials have certain advantageous characteristics than their micro sized replicates do not possess. Nanoscale materials have increased surface area, specific surface characteristics and superior mechanical, electrical, optical or magnetic properties. Nanomaterials surfaces demonstrate a nanoscale roughness and specific surface chemistries, wettability and surface energies. As the ECM structure of bone has nanoscale features, nanomaterials have been explored as an approach to mimic the native ECM structure and allow better control of cell behaviours. Nanomaterials have shown to provide better osteoblast cell adhesion and proliferation than standard materials . The mechanisms for the altered cell behaviour on nanostructured biomaterials are still being understood but the unique surface properties, has shown to play an important part. Protein adsorption onto a surface implant is very important for cells to attach and adhere to . Protein adsorption has shown to be affected by the surface properties including the chemistry, wettability, charge and roughness . Nanostructured surfaces have shown to promote protein adsorption, which aids the cell adherence to biomaterials . Furthermore, cells can sense their nanotopography irrespective of protein adsorption, which can also determine cell adherence . It has been shown that certain cell types prefer nanostructured surfaces compared to smooth surfaces . Tight control of cell adherence is important as the proteins that govern cell attachment allow the signal to be transferred to the intracellular membranes proteins that control cell migration, proliferation and differentiation, which ultimately determine tissue formation . Based on the gold standard of autologous bone grafts, nanobiomaterials scaffolds should have osteoconductive, osteoinductive and osteogenic properties . Osteoconductivity means the scaffold will promote the cell adhesion, proliferation and migration of osteogenic cells . Osteoinductive requires the scaffold to display the chemical or physical cues to initiate stem cells to differentiate towards the osteogenic lineage. Lastly implants should be osteogenic, meaning the material contains osteogenic progenitor cells for bone formation . Therefore, to meet these requirements bone tissue engineering must use a biomimetic strategy, an approach where the scaffold mimics the architecture of the native bone . The three avenues of using nanobiomaterials include using nanoparticles, nanofibres or nanocomposite scaffolds . The advantages and disadvantages of these materials for bone tissue engineering will be discussed below. Phase separation, self-assembly and electrospinining have also been used to generate nanofibres . Electrospinining is the method by which many laboratories have created this architecture, as it is simple, cheaper and cost-effective . The process involves a polymer solution being exposed to a high electric field, which controls the ejection of the material from a syringe . The fibres that are produced have shown to mimic the nanofibrous nature of the native ECM and provide the topographical and orientation for the cells to attach and lay down their own ECM . The collagen fibres of the bone’s ECM are in the range of 50-500 nm, on which apatite crystals are deposited. Using electrospinning it is possible to fabricate fibres, which more closely remember the natural organisation of tissue and move closer to regenerating tissue . Osteoblasts have shown to proliferate to a greater degree on nanofibrous scaffolds compared to control scaffolds [12, 15]. Also nanofibrous scaffolds have shown to support the osteogenic differentiation of MSCs [12, 15]. Both synthetic and natural materials have been electrospun for bone regeneration [16-18]. Polymers alone have been shown to be effective in the regeneration of bone. Polycaprolactone (PCL) a well-characterised and medically acceptable polymer has multiple examples of being electropspun for bone tissue engineering replacements . Composites of polymer and natural materials have been explored successfully for bone tissue engineering. Guo et al. investigated electrospinning aligned and random PCL/gelatin fibrous scaffolds with different mass ratios . The mass ratio of PCL did not change the cell behaviour but cell growth was affected by fibre orientation. Higher elongation ratios also enhanced the cell proliferation and alkaline phosphatase (ALP) activity was greater on alligned fibres . Collagen has been heavily investigated as a scaffold to support bone growth due to its ability to support cell attachment and formation of ECM . Poly-lactic acid (PLA)/collagen I (Col I) nanofibrous scaffolds supported osteogenic differentiation of human mesenchymal stem cells (hMSCs), with evidence of the deposition of bone minerals as shown by scanning electron microscopy and micro-computed tomography images . Chitosan, is a highly research natural material due to its biocompatibility and low immune response . However, it is not able to be electrospun alone so it is often electrospun with other materials. However, Venugopol et al. overcame this issue by electrospinning chistosan in particular solvents with hydroxyapatite (HA). Chitosan/HA electrospun scaffolds were shown to be excellent in promoting cell proliferation, mineral deposition and providing osteoinductivity . Silk (SF) scaffolds have been highly investigated as nanofibrous scaffolds for bone tissue engineering . However, due to the lack of mechanical integrity of electrospun scaffolds techniques to reinforce the electrospun scaffolds have been investigated . The incorporation of nanoparticles into the electropsun scaffolds is one approach to improve the mechanical properties of the scaffolds . The incorporation of HA into silk electropsun scaffolds has shown to enhance the resistance to compression of SF scaffolds. Furthermore, SF-HA scaffolds have been shown to support osteoblast attachment and proliferation . The incorporation of nanohydroxyapatite (nHAP) with scaffolds has been shown to create a more favourable microenvironment that closely mimics the natural bone state has also been shown with other combinations of biomaterials . Chitoson/silk fibroin scaffolds with nHAP nanofibrous membrane also promoted the osteogenic differentiation of hMSCS . 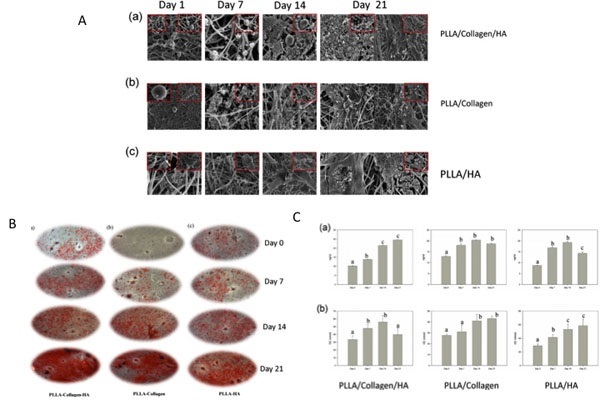 Collagen/nHA/PPLA scaffolds also demonstrated that the incorporation of nHA supported bone formation to a greater degree than poly-L-lactide (PLLA)/Col and PLLA/HA scaffolds . Higher levels of proliferation and up regulation of genes associated with osteogenesis and mineralisation were higher in the tri-composite scaffold  (Fig. 1). Similarly, Collagen/PCL electrospun scaffolds with nanohydroxypatite also stimulated osteogenesis of periodontal ligament cells (Fig. 2) . 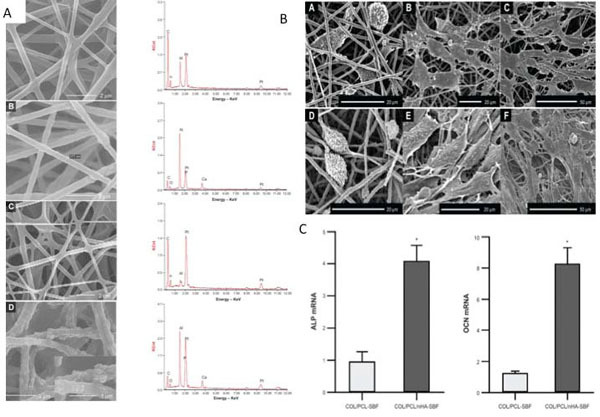 Collagen alone and nHA electrospun scaffolds also supported the osteoblast attachment and proliferation . Fig. (1). A Scanning electron microscopy images of (a) PLLA/Col/HA, (b) PLLA/Col and (c) PLLA/HA scaffold at different time points (0, 7, 14, and 21 days). B. Alizarin red images of the (a) PLLA/Col/HA, (b) PLLA/Col, (c) PLLA/HA scaffolds at different time points. C Levels of Osteocalcin (OC) and Calcium (Ca) in PLLA/Col/HA (a), PLLA/Col (b), and PLLA/HA (c) on Days 0, 7, 14, and 21. Abbreviations; PLLA; Poly(L-lactide), Col; Collagen, HA; Hydroxyapatite. Taken and reproduced with permission from . The incorporation of nanofillers to natural materials has also been investigated with other nanoparticles apart from nanohydroxyapatite. Calcium phosphate nanoparticles incorporated into gelatin/PCL electrospun fibers enhanced the mechanical parameters and accelerated the nucleation and growth of apatite crystals . Silica nanoparticles have also been shown to enhance the osteogenic differentiation of hMSCs on PCL scaffolds . One of the advantages of electrospinning is the ease by which chemical cues are added to the microenvironment of the scaffold. Bone morphogenetic proteins have been explored due to their known osteoinductive capabilities and easy translation to patient use. Several studies have shown the successful incorporation of BMP-2 within electrospun scaffolds and demonstrated enhancement of osteoblast proliferation and adhesion in vitro [27, 28]. The incorporation of BMP-2 with poly(lactic-co-glycolic acid) (PLGA) electropsun scaffolds supported the bone growth of a critical size defect in a rat calvaria model over 12 weeks . The average bone volume and bone mineral density after 12 weeks was around 70% of the values of native bone with the main chemical elements in a similar ratio . Other than growth factors, peptides have been incorporated into electrospun scaffolds to enhance bone tissue engineering. The peptide RGD has been shown to enhance the cell proliferation of osteoblasts on silk/PCL scaffolds due to changes in hydrophobicity and structure of the scaffolds . Drugs have been successfully incorporated into electrospun carriers opening another avenue of applications for nanotechnology for bone tissue engineering . When considering the ideal scaffolds for bone tissue engineering, it is likely that one material does not fulfil all the requirements to be a successful scaffold . Therefore, a valid approach to current therapies for bone regeneration is creating a composite scaffold . This approach is valid since native bone is a composite material and consistent with a hierarchical structure . The most well known composite materials for bone tissue engineering are the ceramic composites. Ceramic materials are very useful for bone tissue engineering due to their high mechanical hardness. Some ceramics include hydroxyapatite (HA), tricalcium phosphate (TCP), bioactive glass (BG) and calcium silicate (CS) . Bioceramics have been shown to exhibit biological compatibility and integrate with bone when implanted within bone defects. Bioactive ceramics have been shown to promote osteoblast adhesion and proliferation . However, bioceramics have had limited success to clinical translation due their brittle nature, slow degradation and difficulty in creating determined shapes. Tricalcium phosphate is a well-known bioasbsorbable ceramic material . It has been shown that TCP can regenerate bone formation, demonstrating bonding with bone when placed within the body . Therefore, developing scaffolds that contain bioceramics may be an effective strategy to mimic the natural composition of bone but a composite scaffold will overcome the inherent deficiencies of bioceramics. Fig. (2). A The morphology and elemental composition of the four scaffolds. (A) COL/PCL with interconnected pores and smooth surface; (B) COL/PCL/nHA with a rough surface and a diameter of about 377 nm; (C) COL/PCL-SBF, few CaP deposits could be seen on the fiber surface; (D) COL/PCL/nHA-SBF, CaP precipitation was visible. B Scanning electron micrographs of PDLCs cultured on the COL/PCL-SBF and COL/PCL/nHA-SBF scaffolds. Cells on the COL/PCL-SBF (A, B, C) and COL/PCL/nHA-SBF (D, E, F) appeared to have no significant difference in morphology. The cells adhered to the fibers were spindle-shaped on the first day (A, D), and then extended gradually and adequately at day 3 (B, E). At day 8, the PDLCs were further flattened and stretched out flopodia. (C, F). C Real-time polymerase chain reaction analysis of ALP and OCN messenger ribonucleic acid expression in periodontal ligament cells on two scaffolds. Abbreviations: COL/PCL, the electrospun type-I collagen/poly(ε-caprolactone) scaffold; COL/PCL/nHA, the electrospun type-I collagen/poly(ε-caprolactone)/nanoscale hydroxyapatite scaffold; COL/PCL-SBF, the electrospun type-I collagen/poly(ε-caprolactone) scaffold immersed in simulated body fluid; COL/PCL/nHA-SBF, the electrospun type-I collagen/poly(ε-caprolactone)/nanoscale hydroxyapatite scaffold immersed in simulated body fluid; CaP, calcium and phosphorus compound. Taken and reproduced with permission from . Natural biomaterials including collagen, chitosan and gelatin have all shown good biocompatibility and support for bone regeneration. Collagen has excellent biocompatibility and has been studied as a component of various composites . Collagen with hydroxyapatite has demonstrated a synergistic combination that can induce osteogenic differentiation of bone marrow derived stem cells (hBMSCS) over 3 weeks . Furthermore, in an ectopic bone formation model the scaffolds produced a large volume of trabecular bone in 2 weeks, which matured as expected to cortical bone . Furthermore, villa et al. demonstrated that collagen-HA scaffolds supported bone formation in vivo and healed a critical size calvarial defect . In this study, collagen-HA scaffolds and commercially available bone graft supplement were compared for their ability to support bone formation in vivo . Furthermore, seeding of bone marrow derived stem cells (BMDSCs) was assessed after direct implantation and with 24 hours of incubation prior to seeding. Immediate loading of cells led to greater bone formation in vivo for both scaffolds . The in-house collagen-HA scaffolds showed higher areas of mineralisation compared with commercial scaffolds incubated overnight  (Fig. 3). Gelatin crosslinked HA foams also demonstrated the ability to heal the 6 x 10 mm bone defect of the femur of a rabbit after 4 months with bone integration into the foam and on the surface . Gelatin hydrogels also showed the ability to support in vivo ectopic bone formation when combined with beta-TCP . Chitosan is explored for medical implants due its low immunogenicity, good mechanical properties and biodegradability. Although many properties of chitosan may be suitable for bone tissue engineering it is very weak and lacks the stability in the aqueous environment . Therefore, chitosan is often blended with polymers and ceramics to improve its mechanical properties. Chitosan and bioglass composite scaffold formed via a foam replication and freeze-drying process have been shown to support the viability, adhesion and proliferation of osteoblast like cells . The addition of chitosan microspheres to calcium phosphate cements (CPCs) is another approach to create a composite blend. Meng et al. demonstrated that calcium phosphate cements modified with chitosan microspheres can repair the femoral condylar defect in rabbits over 24 weeks . Fig. (3). A Schematic of Experimental Design. 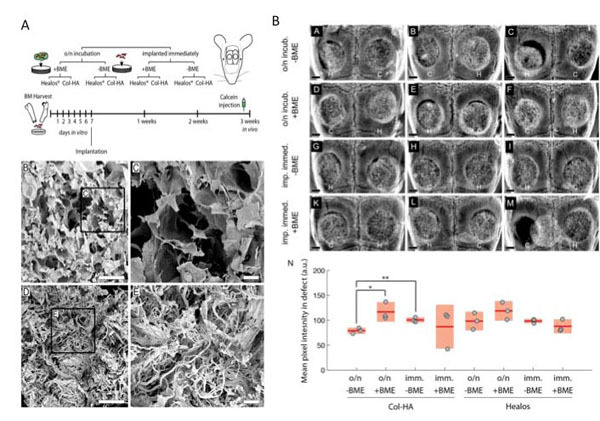 Osteoprogenitors from the bone marrow were expanded in vitro before seeding to collagen-hydroxyapatite scaffolds and implanted in critical size calvarial defects. To label areas of active mineralization, calcein was injected intraperitoneally one-day prior to euthanization at three weeks post-implantation. (B) Electron micrograph of the Col-HA scaffold showing cellular morphology. Scale bar is 500 μm. (C) Enlarged inset from (A). Scale bar is 100 µm. (D) Electron micrograph of Healos scaffold. Scale bar is 500 µm. (E) Enlarged inset from (D). Scale bar is 100 µm. B Radiographs of cell-scaffold constructs after 3 weeks in vivo. (A)–(M) H and C denote Healos and Col-HA scaffolds, respectively. Scale bars are 1 mm. (N) Quantitation of radiographs. Light red bars indicate 95% confidence intervals and blue bars indicate one standard deviation. Taken and reproduced with permission from . Metals have been used widely for bone tissue replacement due to their strong mechanical properties. However, metal implants fail to support osseointegration with the surrounding bone when placed within the body [40, 41]. Several studies have shown that creating nanoscale dimensions on the surface of the implant enhanced bone formation using techniques such as acid/alkali treatment or plasma surface modification [41-43]. Titanium is the most explored metal to date with good mechanical properties including good fatigue resistance and hardness and also no toxicity when placed within the body. To date, most of the research into this area has focused on using ceramic coatings on metals. Ceramic coatings have been investigated to enhance the osteoconductivity of titanium . Huang et al. demonstrated that calcium silicate hydrate coatings enhanced protein adsorption on the titanium, which allowed better osteoblast cell attachment  Cho et al. also showed the deposition of HA onto zirconia promoted the ALP activity and bone marker gene expression of pre-osteoblast cells . Few studies have looked into the complexity of combining ceramics and metals directly. Cunha et al. demonstrated a unique manufacturing process of HA and titanium dioxide (TI02) powders to create a novel calcium phosphate TCP/titania composite scaffold . The β-TCP/TiO2 scaffolds demonstrated good osteoblast proliferation and viability as well as ALP activity . Similar work was completed by Ning and coworkers where HA and titanium powder created a composite scaffold, which demonstrated apatite formation on the surface. Implantation of the novel scaffolds also demonstrated new bone formation . Choy et al. also employed HA into titanium using a microwave sintering technique, which supported load-bearing activities in a rabbit model . Magnesium is an alternative material that has been explored, as it is biocompatible, has better mechanical properties than other metals and has been shown to support bone formation. Magnesium-HA composites have been tested in a rabbit bone defect model. However, it was found that the highest amount of tartrate-resistant acid phosphatase (TRAP) positive cells at the implantation site was using magnesium/ha implants compared to Magnesium only and Magnesium/yttrium implants . It is clear, that further research is required for the optimisation of combining metals and ceramics for optimal bone tissue engineering . The use of polymers for bone tissue engineering is useful as their mechanical properties can be tailored and are able to be manufactured with great flexibility. The biodegradable polymers PCL, PLGA, PLA, and PLGA are the most commonly investigated polymers to be used as a composite material for bone tissue engineering. These polymers offer good biocompatibility and mechanical properties and degradability stability. However, the combination of polymers with ceramic nanoparticles may offer a better cell matrix interaction promoting attachment and ECM formation. Several examples of ceramic/polymer can be found to demonstrate their successful use in bone tissue regeneration. For example, β-TCP/PLLA scaffolds supported the radial bone defect of a rabbit over 24 weeks . Zhu et al. demonstrated that the repair of the one defect was better than control and PLLA scaffold alone . The author concluded that the PLLA composite is a scaffold to warrant further investigation due to the rapid degradation ability and osteogenic action . PGA and beta-TCP also demonstrated to be effective scaffold for bone formation using a solvent casting and particulate leaching technique . The PGA/beta-TCP scaffolds were investigated during the repair of critical bone defects over 90 days . Within 14 days there was evidence of bone formation and healing after 30 days of surgery . Nanocomposites of HA have also shown excellent compatibility and mechanical properties. For example, PLGA/HA produced using particulate leaching/solvent casting technique demonstrated the rapid and strong mineralization and osteoconductivity to repair a radius defect in rabbits . In addition to the nanoparticles being combined with polymers to provide 3D scaffolds for bone tissue-engineering, nanoparticles have been recently investigated to improve bone healing and provide cellular cues for osteogenesis [53-55]. Nanoparticles have been shown to augment regeneration of bone, prevent infection and enhance osseointegration of implants. Nanoparticles are being used in the field of bone tissue engineering in three ways, 1) delivery of bioactive molecules including growth factors, 2) cell labelling to monitor and target and 3) incorporation into scaffolds to improve the materials properties to support bone formation [54, 55]. The nanoparticles used for bone tissue engineering can be classified as degradable such as PLA, PLGA and collagen or nondegradeable including hydroxyapatite, gold and silica nanoparticles [54, 55]. The delivery of growth factors via nanoparticles has been one of the main applications of nanoparticles in bone tissue engineering . The delivery of proteins and growth factors has been shown to be vitally important in bone metabolism and healing. However, the aggregation and short lifetime in the blood have caused researchers to look for alternative methods to deliver these key chemical cues for regenerative purposes. To date research has explored delivering the bone morphogentic proteins (BMPs) family of growth factors due to their high osteoconductive capabilities. Poly(l-lysine) PLL nanoparticles (NPs) delivering BMP-2 with a fibrin hydrogel showed the enhancement of osteogenic differentiation of hBMDSCs . Similarly, BMP-2 coated PLGA nanoparticles also supported the healing of rat calvarial defects . Sustained release injectable nanoparticles (NPs) of BMP-2 were also investigated for the repair of alveolar bone defects in rabbits . The NPs led to the formulation of adequate bone in critical bone defects in 6 weeks . Bioactive glass nanoparticles are widely used as a filler material for orthopaedic applications . They are very useful as nanoparticles due to their ability to bond to bone once implanted within the body. The most common bioactive glass used in bone tissue engineering usually consists of a silicate network. Silica based nanoparticles have been of research interest as their surface can easily be modified and it is simple to link molecules to them . Furthermore, the mesophore structure enables the tight controlled delivery of molecules to the required site . BMP-2 derived peptide and dexamethasone loaded into mesoporous silica nanoparticles demonstrated the ability to enhance the osteogenic differentiation of hBMSCs . Stem cells rely on biological and physiochemical cues to direct their differentiation down specific lineages . The ease and synthesis of gold nanoparticles (AuNPs) have meant that they have been researched for tracking the differentiation capabilities of stem cells . Gold nanoparticles were investigated to promote the osteogenic differentiation of adipose derived stem cells (ADSCs) . Chitosan-conjugated AuNPs increased the calcium content and expression of osteogenic genes at non-toxic levels . The size of the nanoparticles can influence the effect the differentiation of stem cells. Ko et al. explored the effect of gold nanoparticles on ADSCS differentiation using varying sizes including 5, 30, 50, 75 and 100 nm (spherical AuNPs) . All sizes promoted the differentiation of the ADSCs but 30 and 40 nm were preferentially uptaken into the ADSCs and showed the highest differentiation rates . Functionalization of gold nanoparticles has also provided understanding into how surface characteristics of nanoparticles can influence hMSC behaviour. Li et al. functionalised AuNps with different chemical groups including –NH2, -COOH and –OH . The –NH2 enhanced the osteogenic differentiation of the MSCs with higher ALP activity and matrix mineralisation . A very recent development into the use of nanoparticles is the delivery of genetic material via nanoparticles . Several different techniques in using nanoparticles with DNA have been demonstrated. The most common technique is a polymer that can interact with the DNA due to its opposite charge . A common polymer, which has these properties, is polyethylenimine (PEI) . For example, PEI coated superparamagnetic iron oxide nanoparticles (SPIOs) delivered RNA to hMSCS and osteoblasts without any side effects . The PEI coated nanoparticles delivered a BMP-2 gene to enhance bone formation of MSCS with up regulation of ALP activity and alizarin red staining . Similarly, BMP-7 DNA was delivered to induce osteoblast response using silica-based nanoparticles using calcium phosphate nanoparticles . In addition to the delivering molecules to defect site another application of nanoparticle is their tracking ability and guiding cells to target sites . One of the main hurdles in tissue engineering is ensuring that the transplanted stem cells can home to the injured tissue and cause the required regenerative function . Therefore, being able to track the stem cells in vitro and in vivo is important to understand the biology of the stem cells and learn how to manipulate this control . Many studies have used nanoparticles to label and then track stem cells non-invasively using MRI once implanted in vivo. Many different nanoparticles have been looked at for this application including quantum dots, gold and SPIONS nanoparticles [66, 67]. Superparamagnetic iron oxide nanoparticles create superparamagnetism which can create a local magnetic filed which can be picked up on MRI imaging. Several studies have utilised SIPOs in tracking BMMSCs in vivo . While nanoparticles have demonstrated their ability to track stem cell in vivo for regenerative purpose further working is on going to evaluate whether these markers may interfere with their osteogenic differentiation capacity . Studies to date are inconclusive whether MSCs are affected by SPIOs in their bone forming ability . The ability of nanotopographical cues to control osteogenic adhesion and differentiation has attracted the utilisation of nanomaterials for bone regeneration. This paper has summarised the key applications of nanotechnology in current bone tissue engineering research. It is clear that nanostructured biomaterials support osteoblast attachment and the osteogenic differentiation of stem cells for effective bone tissue regeneration. Although nanobiomaterials may provide better control of cell behaviour and in turn bone formation there are many questions in the design of scaffolds to create an ideal bone scaffold that still need to be addressed. Simple parameters, such as the optimal pore size, shape and interconnectivity need to be understood for different manufacturing techniques for successful bone formation. Although nanostructured scaffolds have supported osteoblast behaviour due to their inherent specific surfaces topographies and chemistries, the exact nano surface architecture is not clear. Further research should be considered to understand the relationship and interaction between the osteoblast and the surface for optimal bone tissue engineering. Biodegradable polymers have been researched using different manufacturing techniques for bone tissue regeneration. However, the architecture to provide the optimal mechanical behaviour and also the degradation for bone formation is not clear. The biodegradation characteristics of polymers and natural materials are also not well documented in terms of how this will synergise with bone formation. Fibrous scaffolds have been found to be useful in the attachment of bone formatting cells and in supporting osteogenic differentiation. However, the geometry and size of the fibres for optimal bone regeneration are not clear. Furthermore, the ease of the incorporation of cellular cues in the form of growth factors and peptides has meant that the fibrous scaffolds have received great research interest. However, the exact chemical cue has not been determined to support bone tissue formation. In addition, the release of chemical cues from nanostructured cues needs to be explored and the likely translatability of these release systems when employed in the in vivo setting should be considered. Bioceramics have received the latest research interest due to their cellular biocompatibility and ability to support bone formation in vivo. However, it is clear that a composite ceramic material is likely to be more successful due to the better mechanical and biological properties. Further studies are required to optimise manufacturing techniques to incorporate bioceramics with different materials. In addition, understanding of the effect of incorporating bioceramics within scaffolds on cell behaviour for bone regeneration should be further explored. Although, there is evidence that nanostructured scaffolds do support bone formation in vitro, they have been limited studies in vivo to suggest that these scaffolds will support vascularisation and bone formation in clinically sized critically size defects. Further work, should be undertaken into understanding the best hierarchical architecture to support vascularisation and bone formation in a controlled manner in the in vivo setting. The field of nanobiomaterials has provided an approach to be able to mimic the native ECM and improve bone repair and regeneration. New design concepts and fabrications techniques will help integrate nanotechnology into tailoring treatment for complex skeletal bone defects. We would like to thank the funding from Medical Research Council and Action Medical Research, which provided MG with a clinical fellowship, GN 2339, to conduct this work. Khalili AA, Ahmad MR. A review of cell adhesion studies for biomedical and biological applications. Int J Mol Sci 2015; 16(8): 18149-84. Rosa N, Simoes R, Magalhães FD, Marques AT. From mechanical stimulus to bone formation: A review. Med Eng Phys 2015; 37(8): 719-28. Venkatesan J, Kim SK. Nano-hydroxyapatite composite biomaterials for bone tissue engineering--a review. J Biomed Nanotechnol 2014; 10: 3124-40. Venkatesan J, Bhatnagar I, Manivasagan P, Kang KH, Kim SK. Alginate composites for bone tissue engineering: a review. Int J Biol Macromol 2015; 72: 269-81. Sun L, Stout DA, Webster TJ. The nano-effect: improving the long-term prognosis for musculoskeletal implants. J Long Term Eff Med Implants 2012; 22(3): 195-209. Ingavle GC, Leach JK, Castaño O, Planell JA, Ingavle GC, Leach JK. Advancements in electrospinning of polymeric nanofibrous scaffolds for tissue engineering. Tissue Eng Part B Rev 2014; 20(4): 277-93. Fishero BA, Kohli N, Das A, Christophel JJ, Cui Q. Current concepts of bone tissue engineering for craniofacial bone defect repair. Craniomaxillofac Trauma Reconstr 2015; 8(1): 23-30. Seil JT, Webster TJ. Decreased astroglial cell adhesion and proliferation on zinc oxide nanoparticle polyurethane composites. Int J Nanomedicine 2008; 3(4): 523-31. Jell G, Minelli C, Stevens M. Biomaterial-related approaches: surface structuring In: Fundamentals of tissue engineering and regenerative medicine. USA: Springer 2009; pp. 469-84. Wasim S. An osteoconductive, osteoinductive, and osteogenic tissue-engineered product for trauma and orthopaedic surgery: how far are we? Stem Cells Int 2012. 2012: 236231. Di Martino A, Liverani L, Rainer A, Salvatore G, Trombetta M, Denaro V. Electrospun scaffolds for bone tissue engineering. Musculoskelet Surg 2011; 95(2): 69-80. Lai GJ, Shalumon KT, Chen JP. Response of human mesenchymal stem cells to intrafibrillar nanohydroxyapatite content and extrafibrillar nanohydroxyapatite in biomimetic chitosan/silk fibroin/nanohydroxyapatite nanofibrous membrane scaffolds. Int J Nanomedicine 2015; 10: 567-84. Thomas V, Jose MV, Chowdhury S, Sullivan JF, Dean DR, Vohra YK. Mechano-morphological studies of aligned nanofibrous scaffolds of polycaprolactone fabricated by electrospinning. J Biomater Sci Polym Ed 2006; 17(9): 969-84. Li G, Zhang T, Li M, et al. Electrospun fibers for dental and craniofacial applications. Curr Stem Cell Res Ther 2014; 9(3): 187-95. Venugopal J, Vadgama P, Sampath Kumar TS, Ramakrishna S. Biocomposite nanofibres and osteoblasts for bone tissue engineering. Nanotechnology 2007; 18(5): 055101. Nguyen LT. Enhanced osteogenic differentiation with 3D electrospun nanofibrous scaffolds. Nanomedicine (Lond) 2012; 1561-75. Yang SY, Hwang TH, Che L, Oh JS, Ha Y, Ryu W. Membrane-reinforced three-dimensional electrospun silk fibroin scaffolds for bone tissue engineering. Biomed Mater 2015; 10(3): 035011. Balaji Raghavendran HR, Puvaneswary S, Talebian S, et al. A comparative study on in vitro osteogenic priming potential of electron spun scaffold PLLA/HA/Col, PLLA/HA, and PLLA/Col for tissue engineering application. PLoS One 2014; 9(8): e104389. Wu X, Miao L, Yao Y, et al. Electrospun fibrous scaffolds combined with nanoscale hydroxyapatite induce osteogenic differentiation of human periodontal ligament cells. Int J Nanomedicine 2014; 9: 4135-43. Venugopal J, Low S, Choon AT, Sampath Kumar TS, Ramakrishna S. Mineralization of osteoblasts with electrospun collagen/hydroxyapatite nanofibers. J Mater Sci Mater Med 2008; 19(5): 2039-46. Rajzer I, Menaszek E, Kwiatkowski R, Planell JA, Castano O. Electrospun gelatin/poly(ε-caprolactone) fibrous scaffold modified with calcium phosphate for bone tissue engineering. Mater Sci Eng C Mater Biol Appl 2014; 44: 183-90. Ganesh N, Jayakumar R, Koyakutty M, Mony U, Nair SV. Embedded silica nanoparticles in poly(caprolactone) nanofibrous scaffolds enhanced osteogenic potential for bone tissue engineering. Tissue Eng Part A 2012; 18(17-18): 1867-81. Li C, Vepari C, Jin HJ, Kim HJ, Kaplan DL. Electrospun silk-BMP-2 scaffolds for bone tissue engineering. Biomaterials 2006; 27(16): 3115-24. Nie H, Soh BW, Fu YC, Wang CH. Three-dimensional fibrous PLGA/HAp composite scaffold for BMP-2 delivery. Biotechnol Bioeng 2008; 99(1): 223-34. Del Rosario C, Rodríguez-Evora M, Reyes R, et al. Evaluation of nanostructure and microstructure of bone regenerated by BMP-2-porous scaffolds. J Biomed Mater Res A 2015; 103(9): 2998-3011. Bhattacharjee P, Kundu B, Naskar D, et al. Potential of inherent RGD containing silk fibroin-poly (Є-caprolactone) nanofibrous matrix for bone tissue engineering. Cell Tissue Res 2015. Kim K, Luu YK, Chang C, et al. Incorporation and controlled release of a hydrophilic antibiotic using poly(lactide-co-glycolide)-based electrospun nanofibrous scaffolds. J Control Release 2004; 98(1): 47-56. Levengood SL, Zhang M. Chitosan-based scaffolds for bone tissue engineering. J Mater Chem B Mater Biol Med 2014; 2(21): 3161-84. Villa MM, Wang L, Rowe DW, Wei M. Effects of cell-attachment and extracellular matrix on bone formation in vivo in collagen-hydroxyapatite scaffolds. PLoS One 2014; 9(10): e109568. Gil-Albarova J, Vila M, Badiola-Vargas J, Sánchez-Salcedo S, Herrera A, Vallet-Regi M. In vivo osteointegration of three-dimensional crosslinked gelatin-coated hydroxyapatite foams. Acta Biomater 2012; 8(10): 3777-83. Ben-David D, Kizhner T, Livne E, Srouji S. A tissue-like construct of human bone marrow MSCs composite scaffold support in vivo ectopic bone formation. J Tissue Eng Regen Med 2010; 4(1): 30-7. Yao Q, Nooeaid P, Detsch R, et al. Bioglass®/chitosan-polycaprolactone bilayered composite scaffolds intended for osteochondral tissue engineering. J Biomed Mater Res A 2014; 102(12): 4510-8. Meng D, Dong L, Wen Y, Xie Q. Effects of adding resorbable chitosan microspheres to calcium phosphate cements for bone regeneration. Mater Sci Eng C Mater Biol Appl 2015; 47: 266-72. Wang LN, Jin M, Zheng Y, Guan Y, Lu X, Luo JL. Nanotubular surface modification of metallic implants via electrochemical anodization technique. Int J Nanomedicine 2014; 9: 4421-35. Olivares-Navarrete R, Hyzy SL, Berg ME, et al. Osteoblast lineage cells can discriminate microscale topographic features on titanium-aluminum-vanadium surfaces. Ann Biomed Eng 2014; 42(12): 2551-61. Huang Q, Liu X, Elkhooly TA, Zhang R, Shen Z, Feng Q. A novel titania/calcium silicate hydrate hierarchical coating on titanium. Colloids Surf B Biointerfaces 2015; 134: 169-77. Cho Y, Hong J, Ryoo H, Kim D, Park J, Han J. Osteogenic responses to zirconia with hydroxyapatite coating by aerosol deposition. J Dent Res 2015; 94(3): 491-9. Cunha C, Sprio S, Panseri S, Dapporto M, Marcacci M, Tampieri A. High biocompatibility and improved osteogenic potential of novel Ca-P/titania composite scaffolds designed for regeneration of load-bearing segmental bone defects. J Biomed Mater Res A 2013; 101(6): 1612-9. Ning C, Zhou Y. Correlations between the in vitro and in vivo bioactivity of the Ti/HA composites fabricated by a powder metallurgy method. Acta Biomater 2008; 4(6): 1944-52. Choy MT, Tang CY, Chen L, Wong CT, Tsui CP. In vitro and in vivo performance of bioactive Ti6Al4V/TiC/HA implants fabricated by a rapid microwave sintering technique. Mater Sci Eng C Mater Biol Appl 2014; 42: 746-56. Charyeva O, Thormann U, Lips KS, et al. Histological comparison of new biodegradable magnesium-based implants for maxillofacial applications. J Maxillofac Oral Surg 2015; 14(3): 637-45. Zhu ZJ, Shen H, Wang YP, Jiang Y, Zhang XL, Yuan GY. Effect of beta-tricalcium phosphate/poly-l-lactide composites on radial bone defects of rabbit. Asian Pac J Trop Med 2013; 6(9): 753-6. Cao H, Kuboyama N. A biodegradable porous composite scaffold of PGA/beta-TCP for bone tissue engineering. Bone 2010; 46(2): 386-95. Zhang P, Hong Z, Yu T, Chen X, Jing X. In vivo mineralization and osteogenesis of nanocomposite scaffold of poly(lactide-co-glycolide) and hydroxyapatite surface-grafted with poly(L-lactide). Biomaterials 2009; 30(1): 58-70. Brennan SA, Ní Fhoghlú C, Devitt BM, OMahony FJ, Brabazon D, Walsh A. Silver nanoparticles and their orthopaedic applications. Bone Joint J 2015; 97-B(5): 582-9. Walmsley GG, McArdle A, Tevlin R, et al. Nanotechnology in bone tissue engineering. Nanomedicine (Lond) 2015; 11(5): 1253-63. Uskoković V, Desai TA. Nanoparticulate drug delivery platforms for advancing bone infection therapies. Expert Opin Drug Deliv 2014; 11(12): 1899-912. Kyllönen L, DEste M, Alini M, Eglin D. Local drug delivery for enhancing fracture healing in osteoporotic bone. Acta Biomater 2015; 11: 412-34. Park KH, Kim H, Moon S, Na K. Bone morphogenic protein-2 (BMP-2) loaded nanoparticles mixed with human mesenchymal stem cell in fibrin hydrogel for bone tissue engineering. J Biosci Bioeng 2009; 108(6): 530-7. Hassan AH, Hosny KM, Murshid ZA, Alhadlaq A, Alyamani A, Naguib G. Depot injectable biodegradable nanoparticles loaded with recombinant human bone morphogenetic protein-2: preparation, characterization, and in vivo evaluation. Drug Des Devel Ther 2015; 9: 3599-606. Zhou X, Feng W, Qiu K, et al. BMP-2 derived peptide and dexamethasone incorporated mesoporous silica nanoparticles for enhanced osteogenic differentiation of bone mesenchymal stem cells. ACS Appl Mater Interfaces 2015; 7(29): 15777-89. Singh M, Harris-Birtill DC, Markar SR, Hanna GB, Elson DS. Application of gold nanoparticles for gastrointestinal cancer theranostics: A systematic review. Nanomedicine (Lond) 2015; 11(8): 2083-98. Choi SY, Song MS, Ryu PD, Lam AT, Joo SW, Lee SY. Gold nanoparticles promote osteogenic differentiation in human adipose-derived mesenchymal stem cells through the Wnt/β-catenin signaling pathway. Int J Nanomedicine 2015; 10: 4383-92. Ko WK, Heo DN, Moon HJ, et al. The effect of gold nanoparticle size on osteogenic differentiation of adipose-derived stem cells. J Colloid Interface Sci 2015; 438: 68-76. Li JJ, Kawazoe N, Chen G. Gold nanoparticles with different charge and moiety induce differential cell response on mesenchymal stem cell osteogenesis. Biomaterials 2015; 54: 226-36. Lü K, Zeng D, Zhang W, et al. Ectopic study of calcium phosphate cement seeded with pBMP-2 modified canine bMSCs mediated by a non-viral PEI derivative. Cell Biol Int 2012; 36(2): 119-28. Hadjicharalambous C, Kozlova D, Sokolova V, Epple M, Chatzinikolaidou M. Calcium phosphate nanoparticles carrying BMP-7 plasmid DNA induce an osteogenic response in MC3T3-E1 pre-osteoblasts. J Biomed Mater Res A 2015; 103(12): 3834-42. Mok H, Zhang M. Superparamagnetic iron oxide nanoparticle-based delivery systems for biotherapeutics. Expert Opin Drug Deliv 2013; 10(1): 73-87. Bull E, Madani SY, Sheth R, Seifalian A, Green M, Seifalian AM. Stem cell tracking using iron oxide nanoparticles. Int J Nanomed 2014; 9: 1641-53.